Greetings from the St. Lawrence! We have officially reached the end of the Great Lakes and are now heading eastward towards Montreal and Quebec City. Tomorrow is Gananoque. We are in the official 1000 Islands and if the first day’s anchorage is any indication, we are going to really enjoy the rest of the trip! The water is clean, there are lots of nice anchorages, some even have picnic sites and walking trails and excessive noise as well as running your engine or generator is not allowed. So, this is the place for me! 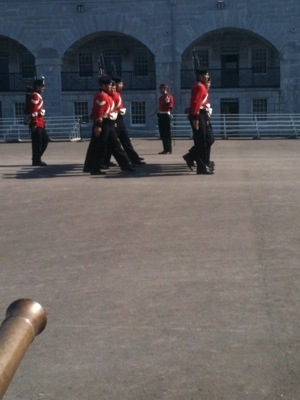 This morning, since we were about 100 metres away from Fort Henry, we thought we had better check it out. Fort Henry is the main attraction of Kingston so we rowed over to the fort, climbed the hill, paid our admission and wandered around for a couple of hours. It is pretty amazing (as forts go). 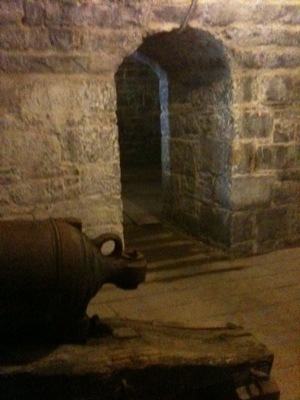 The stonework is beautiful – the walls are very thick. There is also a moat around the fort (dry now) but I can’t imagine how much work it would have taken to complete the fort – all by hand too. There were quite a few people in costume, doing some heavy duty marching around in the parade square. They must have been boiling in their red wool uniforms! The most fun part though was watching the kids take part. Under the direction of a park employee, the kids put on uniforms and learned how to march. It was pretty funny and it looked like they were having a great time! After our tour of the fort, we headed back down the hill and dinghied back to the boat. 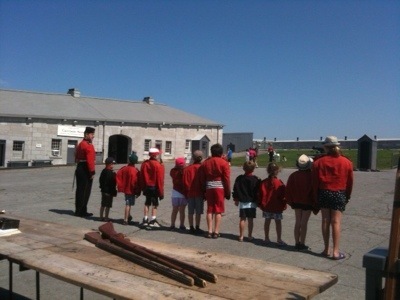 We were surrounded by the Royal Military Sailing School (with varying degrees of skill). They looked like they were having fun too with the occasional tipping of boats and near collisions. They all had helmets on though – I guess there must have been one too many whacks in the head with the boom! On the boat, we discussed where we would go next. We also started the generator and after a few minutes, I noticed a big pool of water on the floor (or should I say deck?). Unfortunately, the generator had malfunctioned so Dennis had to figure out where it needed fixing. He thought it needed a part of some sort and we were quite close to Kingston Marine, so we quickly pulled up the anchor and headed back to Kingston (it was only one bay away but we wanted to catch the 1:00 bridge). 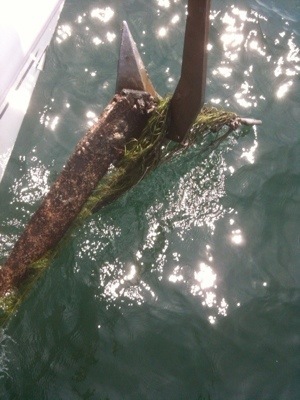 We had a good laugh when we saw what the anchor had pulled up. A rudder from the sailing school! We dropped the anchor in the inner harbour of Kingston and Dennis got to work right away. He actually fixed the problem (whatever it was) without having to order parts so by 2:15, we were ready to go. We had to wait until the 3:00 bridge but once it was up, we just sailed on out of Kingston and are here now at the Milton Island anchorage. We hiked around the island and again, were amazed at the facilities available. We are looking forward to the next week or so. After that, Montreal, Trois Rivieres and then Quebec City! Looks really neat. I am jealous – you must be so much cooler than I am! If I jumped into the water I would sizzle! Meg has gone to New York and not contacted us yet so R is having fits!